Are You in Need of Door Hinge Repair Dublin? Well you have found the right guys! Get your door hinges adjusted, repaired, or replaced by one of our efficient door repair men. 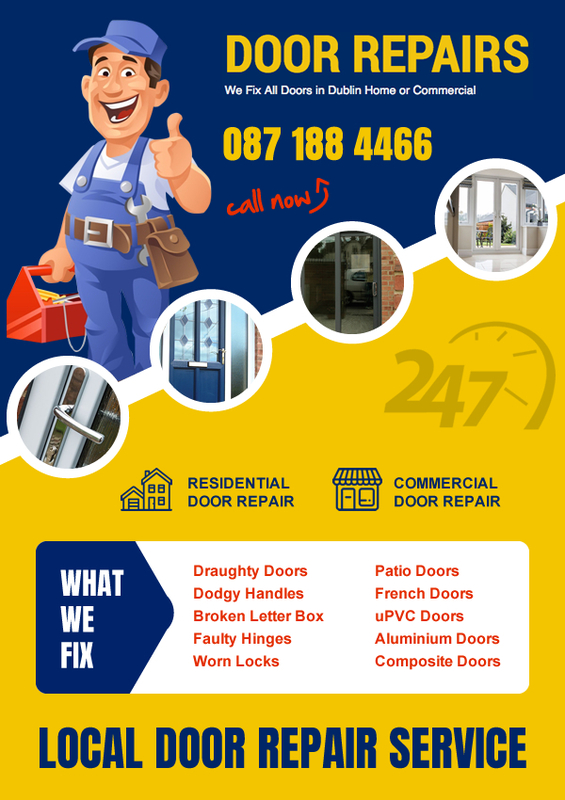 Fixing of damaged doors, frames, locks, hinges, letterboxes or handles is what we do best. Your door hinge might be damaged due to wear and tear or maybe it is old, or is completely un-repairable after a burglary attempt. If it’s not locking anymore or drafty, then we can help you with repairing your door. We offer an 24 hour emergency door hinge repair service in Dublin and can repair locks and lockouts on doors to keep you secure anytime, day or night. All our vans are fully stocked so we can carry out immediate 24/7 door repairs any where in Dublin 24hrs a day on 087 188 4466. Extremely fast, professional door technician Paul who replaced our uPVC door hinges. After repairing and replacing the damaged hinges on both sides of the uPVC door he recommended the proper security measures and cleaned up any mess. Would use these guys again without reservation.